Listen to FREE ‘music with a jazz and urban flair’ at the National Museum of Mexican Art, tonight from 7-10pm! Tonight will be the biggest event yet for The Jazz Series, a monthly music and art event that travels to different spaces around Pilsen, such as Pilsen Outpost and Cultura in Pilsen, and is presented by local independent publication AMFM mag. If you haven’t gotten a chance to check out this amazing and FREE event, now is your chance! 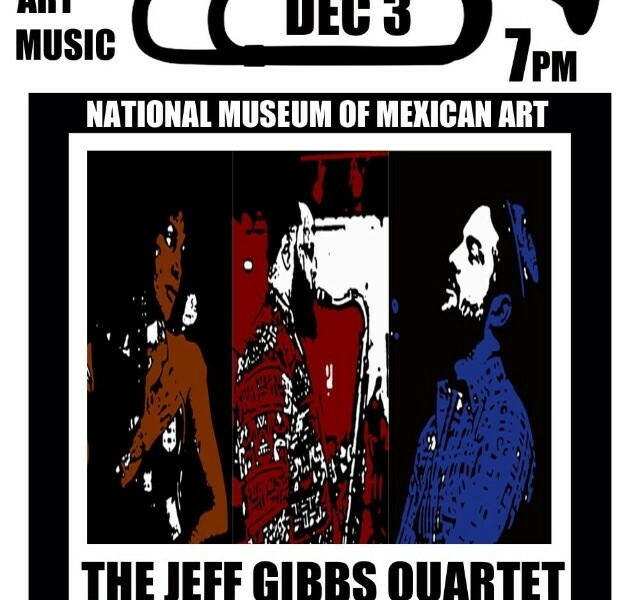 AMFM will be popping up at at the National Museum of Mexican Art December 3rd in Pilsen in Chicago and we’ve got a GREAT lineup featuring The The Jeff Gibbs Quartet, Koku Gonza, and Cole DeGenova and our Jazz Series house band, The Hazy Drips! Come out for a night of great music for FREE! The Jazz Series happens in spaces in Pilsen featuring local up and coming musicians who play music with a jazz and urban flair. For each show, a visual artist will take over the space with a solo exhibition, and musicians will grace your ears.